At a height of 2200 feet, Sudhagad alias Bhorapgad has a huge platue of around 50 acres which offers a wonderful camping site. It has a punishment point called Takmak tok, an ancient Bhoraidevi temple and a grand Mahadrwaja. There is a secred chor daarwaja near the Mahadarwaja which if accessible can be used to reach the bottom of the Mahadarwaja bastions. From the Sudhagad platue you can see the ominously standing Tel baila which looks like a giant movie screen rising up from the platue opposite the Sudhagad platue. The nearest from from here is Ghangad and Sarasgad. If the skies are clear Dukes nose, Koraigad are also visible in the northeast behind Tel-baila. 09:30 hours  Reach Pen and have breakfast (Second Pickup poin) for members coming from other cities of Maharashtra. 09:45 hours  Board a S.T./Jeep for Thakurwadi. 11:00 hours  Reach Sudhagad base crossing Pali (we will not be stopping at Pali; those who want to visit Pali; can do so second day if we have time). Total Capacity 25. Rs.100 Discount for members (Carry your discount coupons). Directly do a electronic transfer. SMS the details "Chq. No., amount, your name and event" to one of the mobile numbers given below or email it to  natureknights@ yahoo.com. Please note- Participants doing electronic transfer have to pay an additional charge of Rs. 25/- per transaction. Track Pants; Tights; or loose comfortable trousers; avoid jeans, they are not suited for trekking. Shirt, T-Shirt, Kurta (Preferable full sleeves; this prevents sun burns and mosquitoes, other allergies). Shoes  trekking shoes or touch sports shoes. Avoid shoes with high heals. Please note: Rainware (ponchos) & backpacks are available for sale & hire (only if informed in advance.) Kindly contact us for details. 1) 2 meter x 2 meter plastic sheet - to spread on the ground because of dampness of the monsoons. 7) Walking Cane (should be 65% to 70% of your height  strong and light)  helps reduce stress while walking or if you wish to invest in more expensive one buy folding cane made of fiber. 8) 3 liters of water  Availability of potable water is not ascertained; we will have to process and boil the water we drink for the next day. 9) Snacks for the route  Dry Fruits; Fruits; Salad Items; chocolates; biscuits etc. 11) Carry a not pad and two ball pens for your diary writing. 12) Sleeping bag & Sleeping mat or two bed sheets- Accommodation is in an ashram so be well prepared to sleep on the floor. 13) Personal Medical Kit (check list given below). Pack all your items in double plastic pouches sealed with rubber bands before keeping them in your backpack or rucksach. Keep provision for some space in your bag to carry one kg ration that will be given to you by Nature Knights. Carry a very small nap sack or handy bag. Place of Stay: We will be staying in either temple complex or Ashram. Eco-Tourism Etiquettes to be followed in All Nature Knights Events. Camps organized by "Nature Knights" are in the eco / culturally -sensitive area like Sanctuaries, Jungles, and places of Historical importance. We strongly believe in traveling in small groups, leave only foot prints and take only memories. Basic Fitness is important so that you enjoy the trek to the maximum rather than just surviving and enduring it. Built strength training (weights or GYM or at least do Surya Namaskar; Pushups; Squats and Stomach Crunches). 20 minutes 3 to 4 times per week is OK.
Pranayam  Breathing exercise for developing stronger lungs. 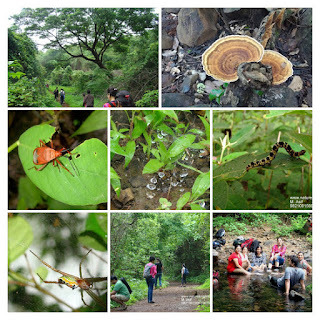 Looking forward to meet you for another exciting Nature Trek and Fort Exploration Event. 2) Bettnovet  C "Anti Fungal Skin cream"
9) Pain killers and / or any other personal medication recommended by your family doctor. 16) Carry all Personal medical kit and personal toiletries in a separate pouch.